I’ve mentioned in passing that I’m writing a book. Well, I can now say that I’ve written a book. That’s right, guys. It’s getting real up in here. Now that the manuscript is done, I wanted to tell you guys a little bit more about the project, what it entailed and what comes next. Even before I was blogging about money, I was interested in personal finances. I’d read book after book on how to make my money better. There were some crazy great hacks. Like opening CDs before the Recession. Or investing your money starting young so you could take full advantage of the power of compound interest. I wrote out goals and future budgets, but something was missing. That missing thing was an income which met more than just my baic needs so I could do things like save and invest. I was great at money management; I just didn’t have enough green to do all the responsible things I wanted to do. I now recognize that there were some systemic road blocks in my way at that point in my life. I also recognize that there are women out there who face far larger and more frequent road blocks than myself. And that’s the piece of financial advice that seems to always be missing: When you’re motivated, disciplined and hard-working, yet you can’t seem to get around these massive obstacles, what do you do next? 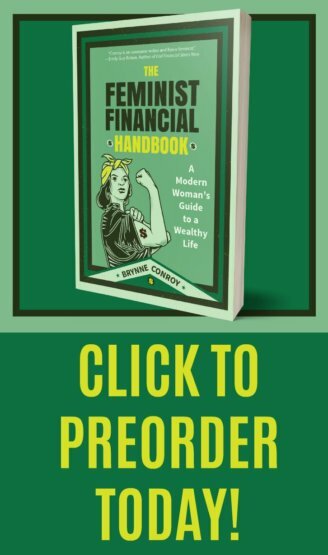 That’s what The Feminist Financial Handbook is about. It’s about recognizing oppression and its effects on our day-to-day personal economies. Without minimizing these struggles, it looks at ways you may be able to get a leg up so you can do all those fun things like watch your wealth explode over a period of 30-40 working years through diligent investing. It’s about being real about the real-life situations so many of us struggle with every single day, and finding ways to take action despite them. The first part of the book looks at how we define wealth. Does money actually make us happier? I don’t want to spoil too much, but the answer is sometimes. In this part of the book, we also take a deep dive into the things that actually can make us feel more content, and counting them holistically in our personal wealth equations. Because while money scarcity is no good, a relentless pursuit of cash isn’t healthy, either. Women gravitate towards lower-paying fields. Women carry babies in their wombs. These are all poor justifications for paying women less, and some are straight up untrue. in the book, we tackle each one of them. Gender is not the only reason for lower pay, though. Whether you’re a single mother, disabled, a woman of color, transgender, gay, or bi, society is going to punish you economically. It’s not right. But there are some workarounds for financial success, even within a system that would have you believe you’re worth less. You’re not worth less, by the way. And this whole section of the book outlines why that is and what we can collectively and individually do about it. Not only is there a wage gap, but there is also a gender-centric investing gap. This gap starts young, and can result in poverty in old age. We take a look at some of the basics of financial planning and how to become more aware of any internalized sexism that may be affecting your investing decisions. We also look at how you or your child can go to college for free–or sometimes even get paid to go back to school. I promise this is real. These strategies have worked for me in real life, and are backed by a professional in the higher education industry. And, of course, we look at budgeting. Not just budgeting, but judgement-free budgeting. Just because you’re a woman doesn’t mean you’re not allowed to spend the money you earn, or that you can’t stash it all away in pursuit of financial independence. But to do either one of these things, you’re going to need a budget. Ladies, we put up with some intense experiences in our lives. Because of the normalization of sexism and other -isms, we suffer much higher rates of mental illness and domestic violence. Both of these areas have real, long-term affects not just on our mental health, but on our finances. We also tend to make less money than our male counterparts when a child is diagnosed with an illness or is pronounced differently abled. And that’s on top of the gender pay gap. This final section of the book looks at all of these things, offering up solutions for living a wealthy life in spite of the effects oppression can take on our bodies, minds and finances. Believe it or not, these are just some of the topics covered in the book. The pages take a deep dive into so many issues–issues not typically discussed in the personal finance sphere. Because they’re hard issues to tackle, and there aren’t always easy solutions. But at the heart of the matter is hope. Hope that we can fight the system to build a successful career for ourselves as women in business or a fat e-fund as homemakers. Hope that you can build a wealthy life even when the system would stunt your cash flow. It affirms that you are worth it and capable no matter what society tells you, because there is no “right” way to be a successful woman with motivation. Now that we’re getting ready to launch, you can pre-order today from Amazon or Barnes & Noble. I’d be so grateful if you could hop on board and join the waitlist so you can be one of the first to get your hands on a copy! I can’t wait to hear what you think. It’s been a huge effort to produce, and I hope it opens up a lot of conversation about what we can do to make the economic plight of women better, whether we’re talking about society as a whole or ourselves as individual females. This entry was posted in College Money, Family Finance, Money Management, Think, Ways to Make Money, Ways to Save Money on July 31, 2018 by femmefrugality. Woohooo! I’m so excited for you! and of course, i LOVE the title. Thank you so much! And, yes, “feminist” HAD to be in the title! So excited to read this! Congratulations!!! And I think the angle is really sharp, and timely, too. Thank you, friend! Yes, it definitely is. We worked on refining it to be relevant–want to keep it applicable to people’s day-to-day lives! That’s amazing! So excited to see it! Thank you, Kristine! Just a couple months till the finished product is here! Congratulations on the book! That’s so exciting to have your words being published. I also love the focus on how things other than money effect money. That’s one of the topics we hope to explore on my blog, because there is so much more to finance than finance. My co-blogger and I are hoping to write a book in the next year or so, and I’ll definitely be asking your advice on it when we do. Can’t wait to read the book! So much truth! And happy to help in whatever capacity I can when the time comes! Congratulations! I’ll definitely request that my library purchases a copy to add to our digital collection when it comes out! Congratulations on your accomplishment as an author. I would love to read the book and get all the useful information.